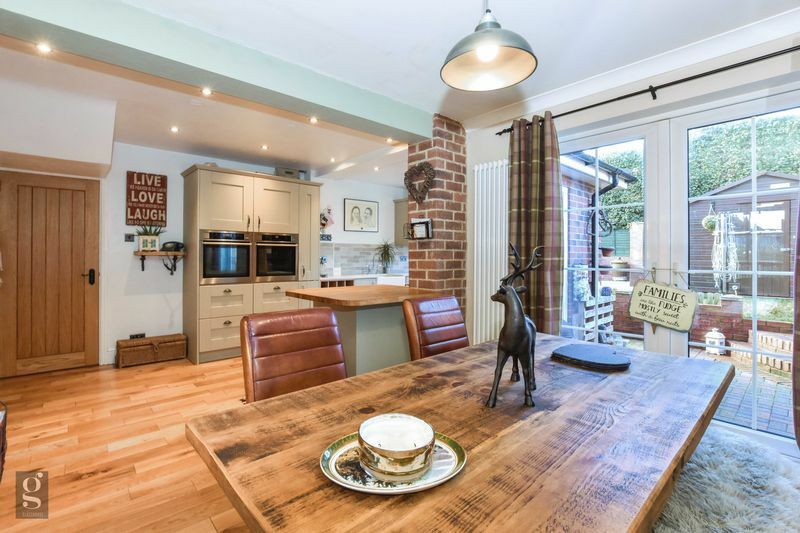 An extended, 4 double bedroom semi-detached period family home, gorgeously presented and quietly nestled in a little known cul-de-sac at heart of always sought after Tupsley. 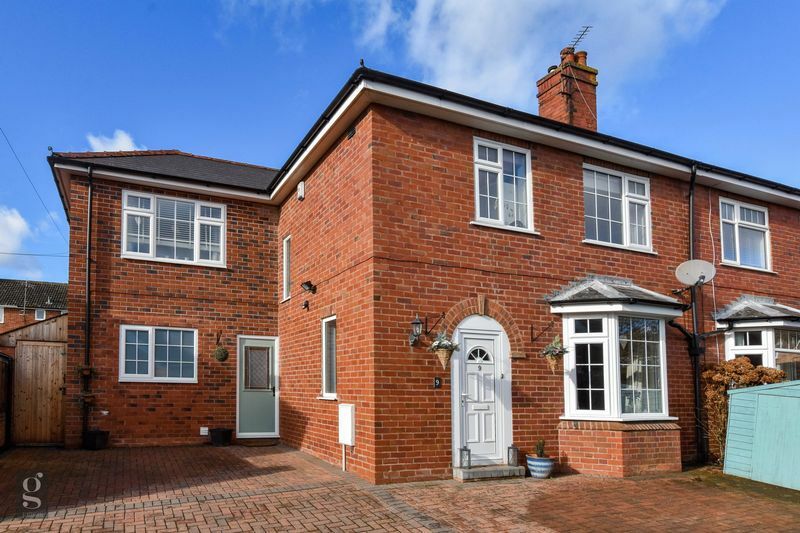 This beautifully presented family home was extended a decade ago to now also provide a very desirable and highly malleable Family Room, practical Utility with above a Master Bedroom offering a spacious, full Ensuite Bathroom. 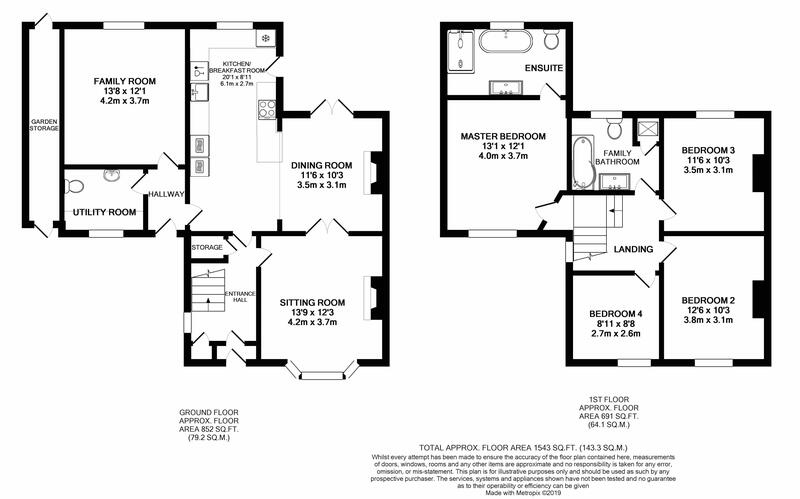 The current owners have instigated some reconfiguring and a full refurbishment to maximise the family-friendly layout and flow throughout. 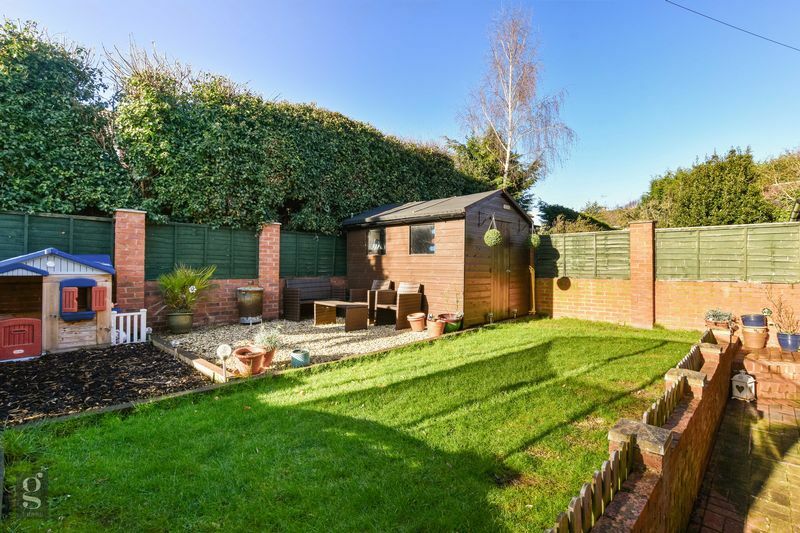 Enjoying an excellent location nestled away on a discreet and very quiet cul-de-sac, the property lies at the heart of amenity rich Tupsley, offering within walking distance; newsagents, post office, convenience stores, pub, GP, pharmacy, butchers and both hospitals. 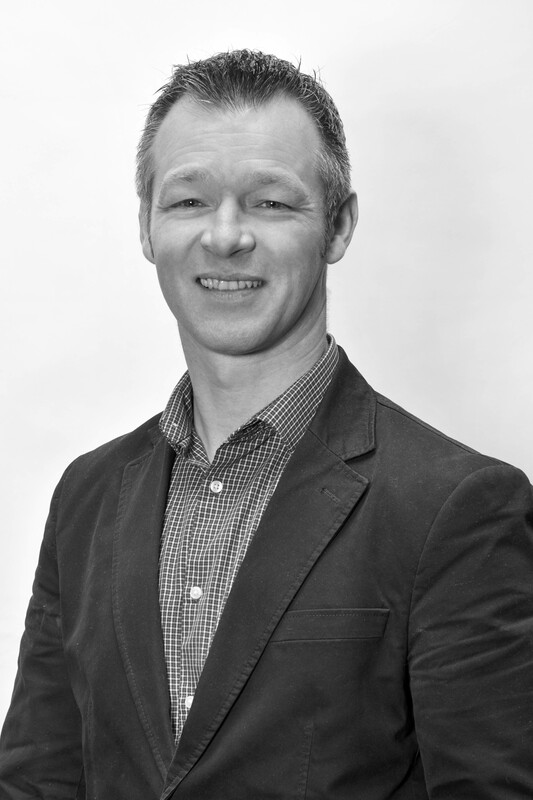 Nearby also lies the full gamut of educational institutions from Ofsted “Excellent” and “Good” primary schools and Bishop Bluecoat secondary, through to the Hereford Sixth Form, Colleges and nascent University. While for leisure the Quarry with its playing fields, dog park, children’s playground and Scouting Hut is also a short stroll. 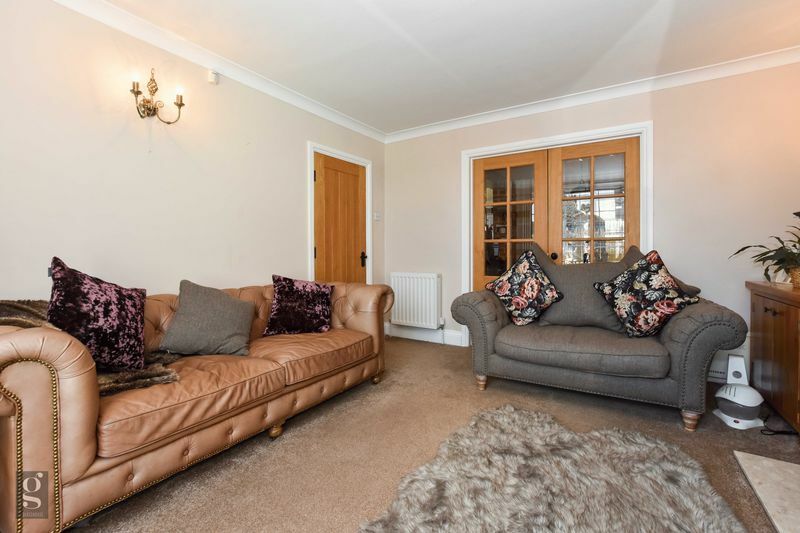 Front Porch and Entrance Hall – The front door opens into a small porch offering hanging space and storage before the inner door opens into the bright and airy Entrance Hall. 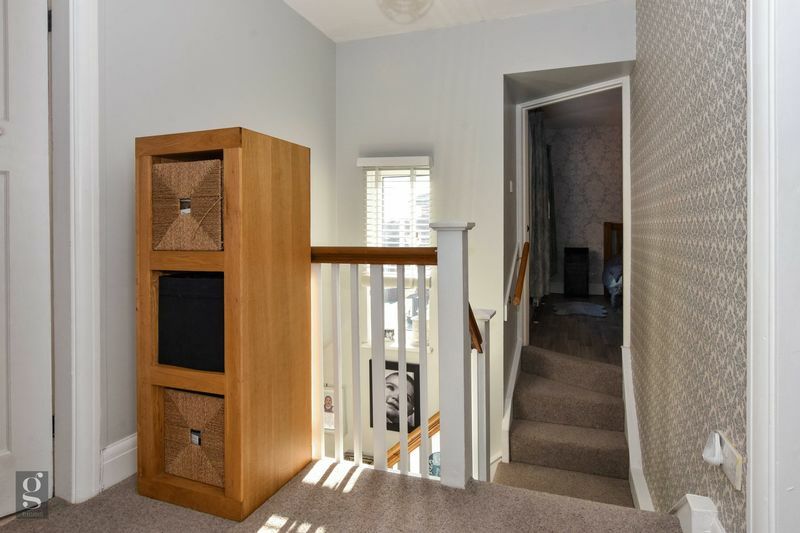 The Hall Closet has hanging rail and fitted shelving while an Under-stairs Cupboard provides yet more practical storage. 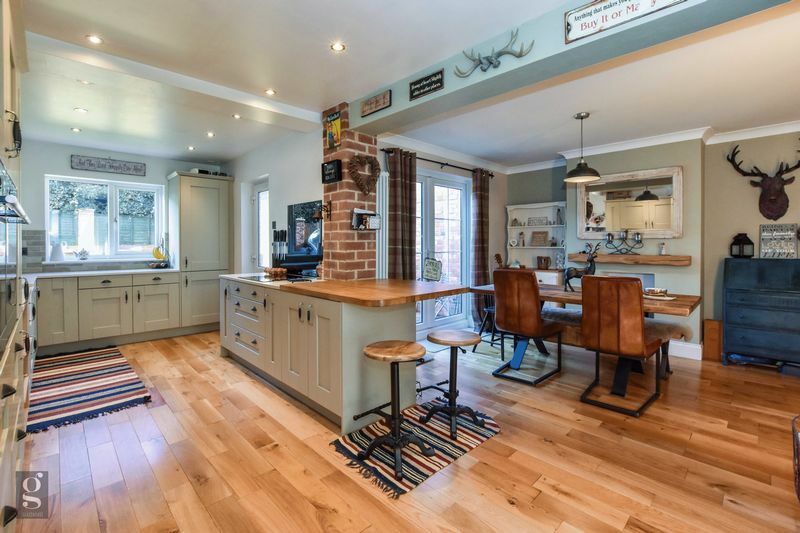 Warm-toned, oak hardwood flooring runs throughout the Hall and Kitchen/Dining Room beyond. 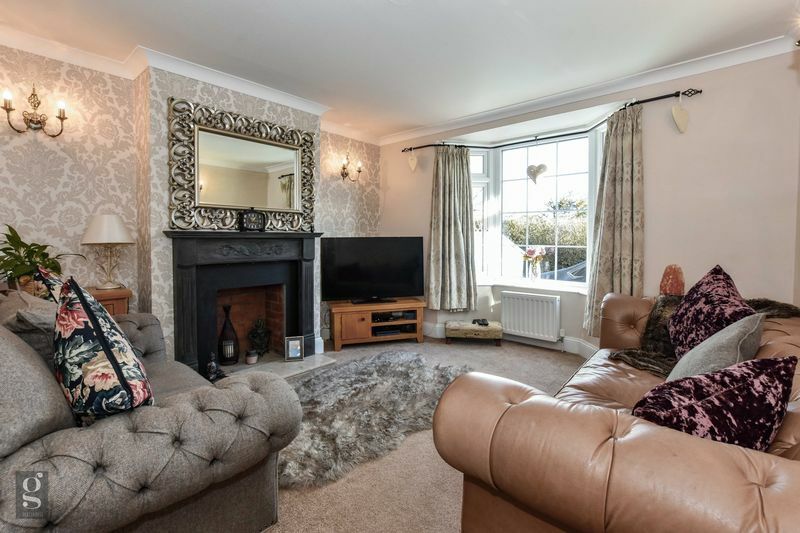 Sitting Room – With a pretty bay window, the inviting Sitting Room also features a fireplace with black mantelpiece surrounding a characterful red brick recess, once home to a gas fire. 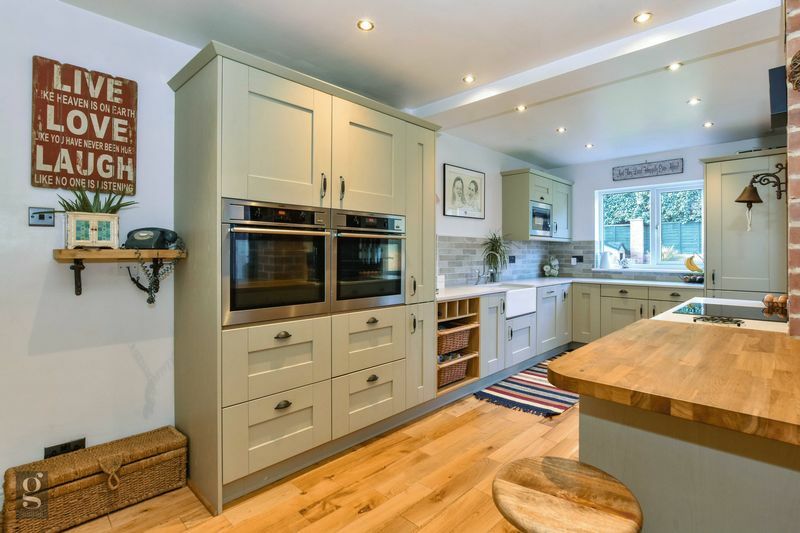 While double half-glazed oak doors directly connect to the Dining Room beyond. 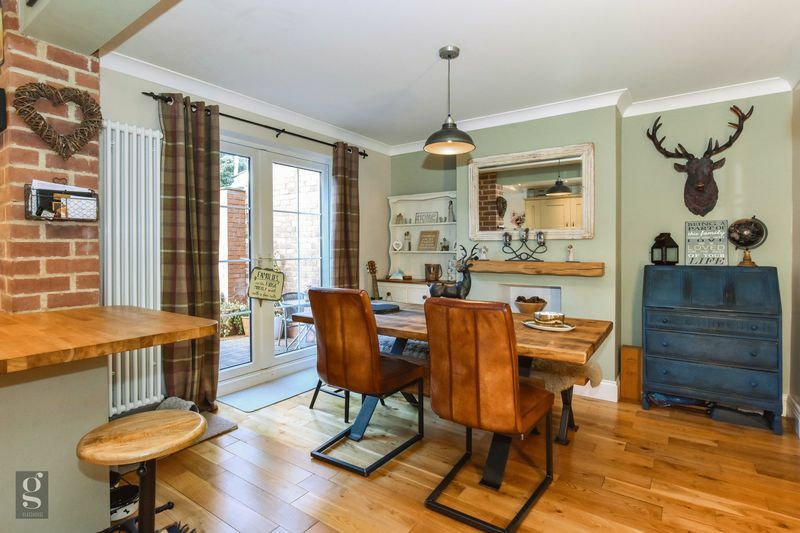 Dining Room – Enjoying an open plan flow from the Kitchen, the Dining Room features a solid chunky wood mantel with fireplace recess below home to an outlet for an electric fire, while double French doors lead out onto the brick paviour patio of the rear garden. 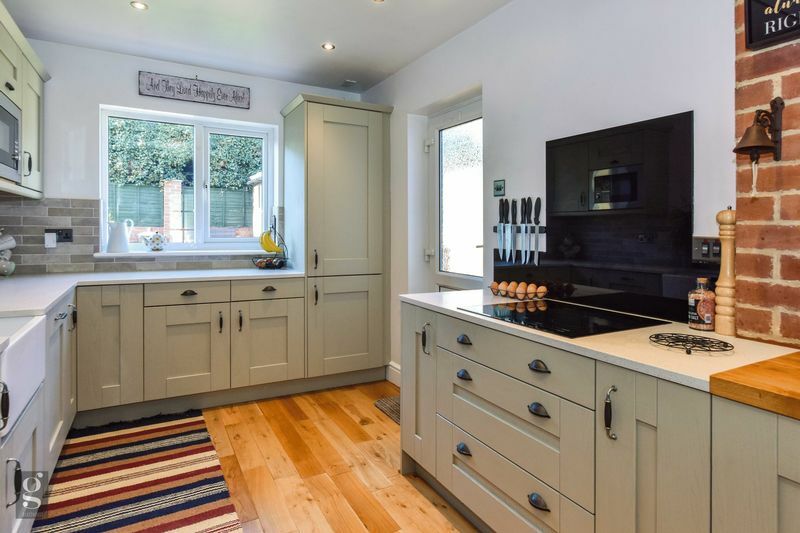 Kitchen – The smart modern Kitchen is fully fitted in classic Shaker units providing an array of storage including; full height pull-out larder cupboard with wire racking, bottle store with wicker baskets below and deep pan drawers. 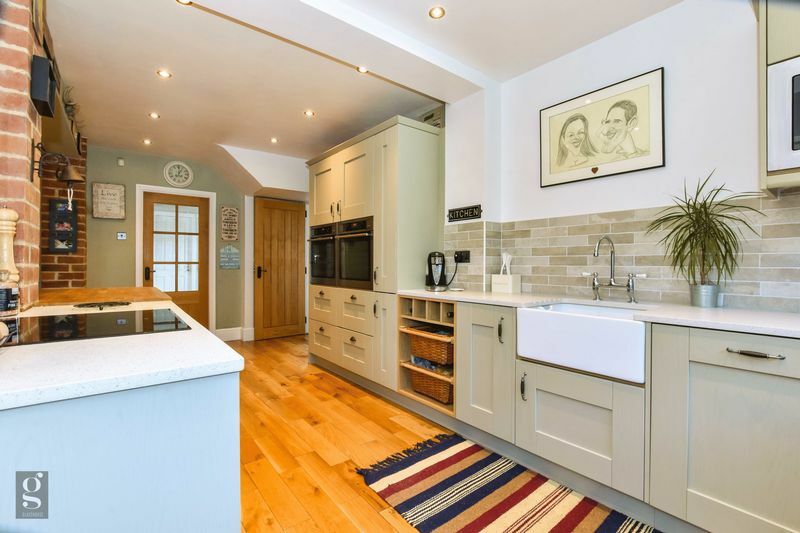 Integrated are double, side by side AEG ovens, Induction hob, Bosch dishwasher and fridge/freezer. 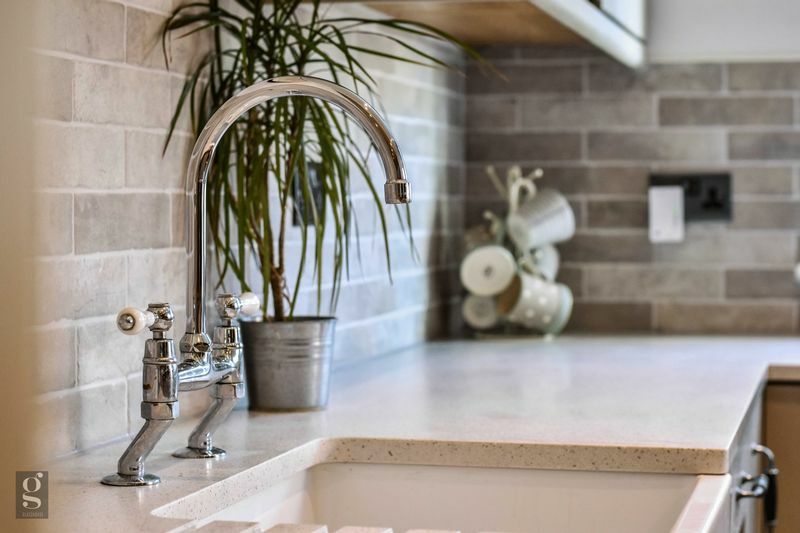 Fresh white Corian countertops extend across most of the Kitchen and surround the Belfast sink, yet the use of the solid wood countertop on the peninsular creating a wide breakfast bar provides a warm contrast and connects the Kitchen outwards into the Dining Room. 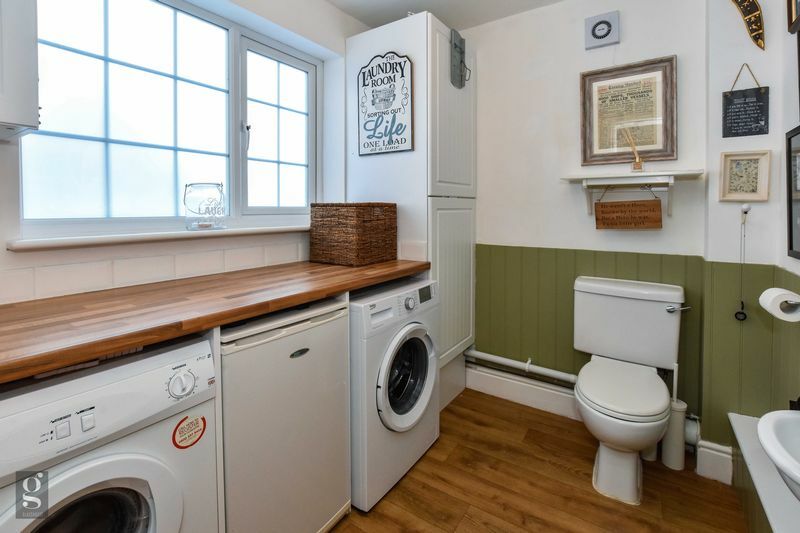 Utility/Downstairs WC – The practical Utility features a full height cupboard providing useful storage for household essentials and a fitted countertop with space below for not only washer and dryer but perhaps an additional freezer too. The large opaque window ensures privacy for the far side of the room with its WC and wall-mounted basin. 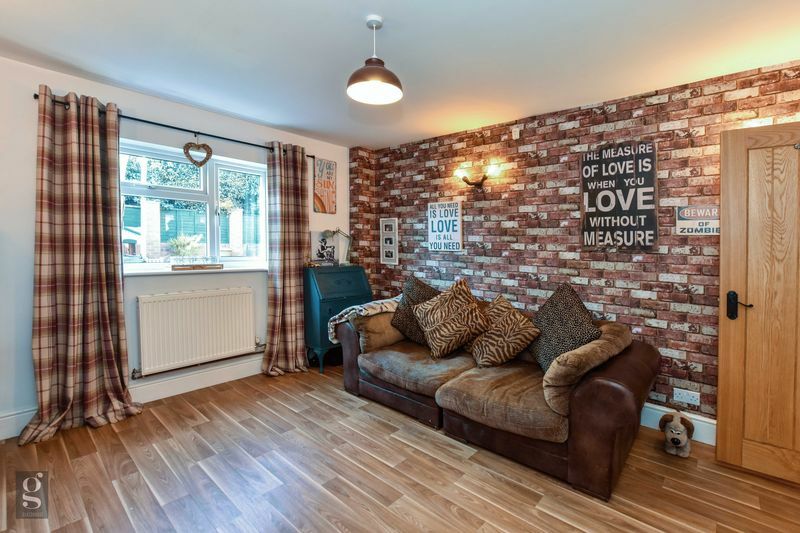 Family Room – With a large window with views across the rear terraced garden the Family Room with practical, wood-effect laminate flooring offers a highly malleable space. An obvious informal hangout for the whole family with wall-mounted TV point, it offers a great playroom for younger children but will easily morph over the years into the perfect teenage Rumpus Room; ideal for everything from hobbies and crafting through to gaming, music, even perhaps serious study. 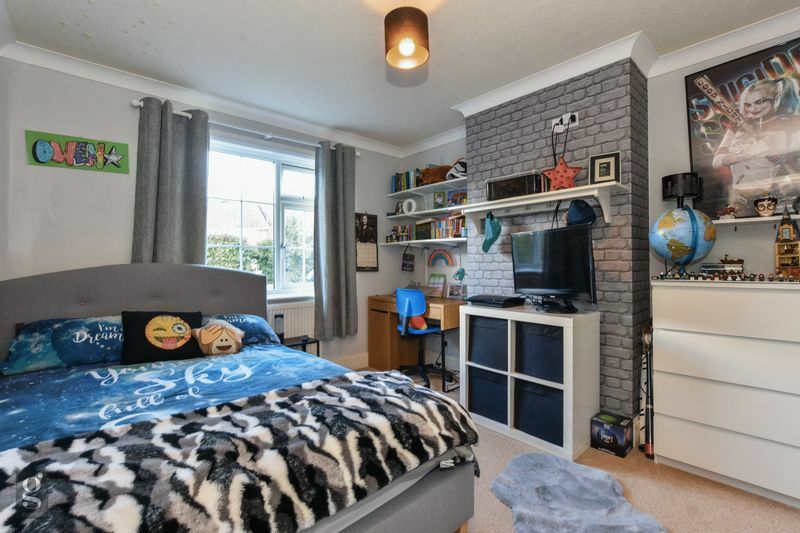 Master Bedroom – The Bedroom with laminate wood-effect flooring enjoys views to the front across the cul-de-sac to the open countryside of Dinmore Hill beyond. 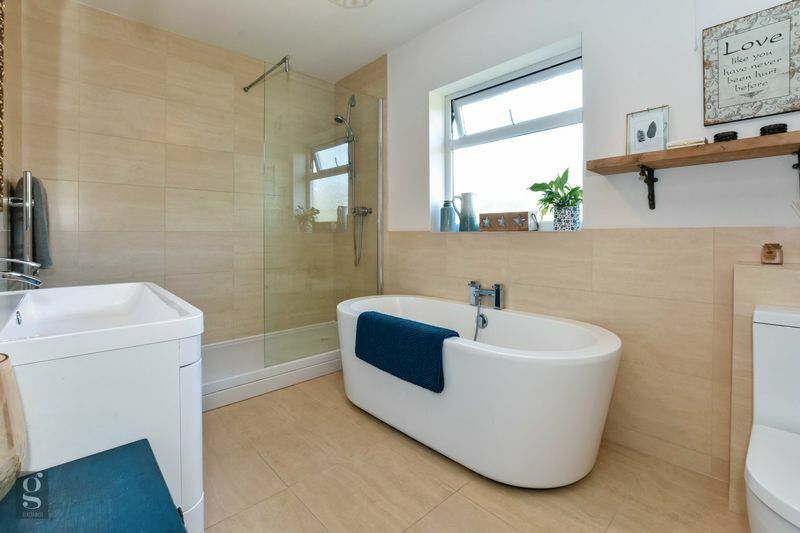 The spacious Ensuite features a double-ended bath with centrally mounted taps and shower attachment and a separate raised walk-in shower enclosure with glass screen. 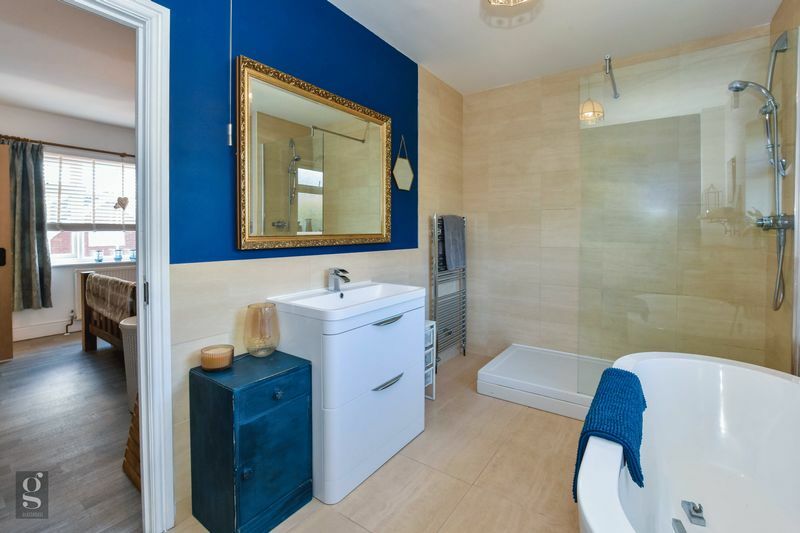 The Bathroom is completed by chrome heated towel rail, WC and a modern rectangular basin unit with 2 integral deep storage drawers. 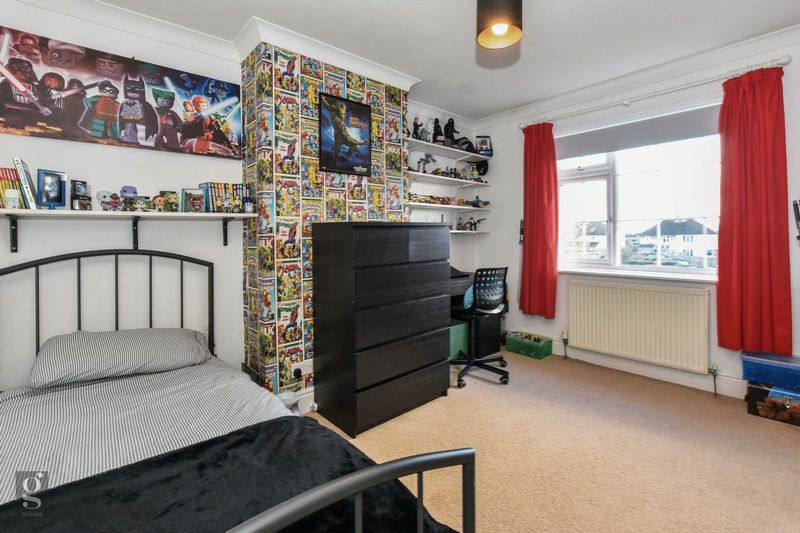 Bedrooms Two and Three – Both carpeted Double Bedrooms are of all but equal size, with fitted shelving dominating to one side of the chimney breast and enjoying views overlooking the front or rear garden. 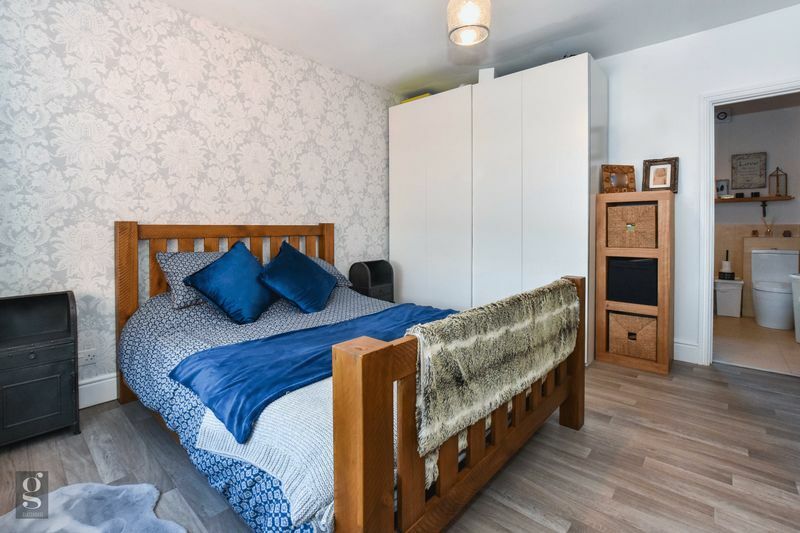 Bedroom Four – A smaller Double Bedroom with laminate wood-effect flooring, enjoys views across the front driveway and beyond. 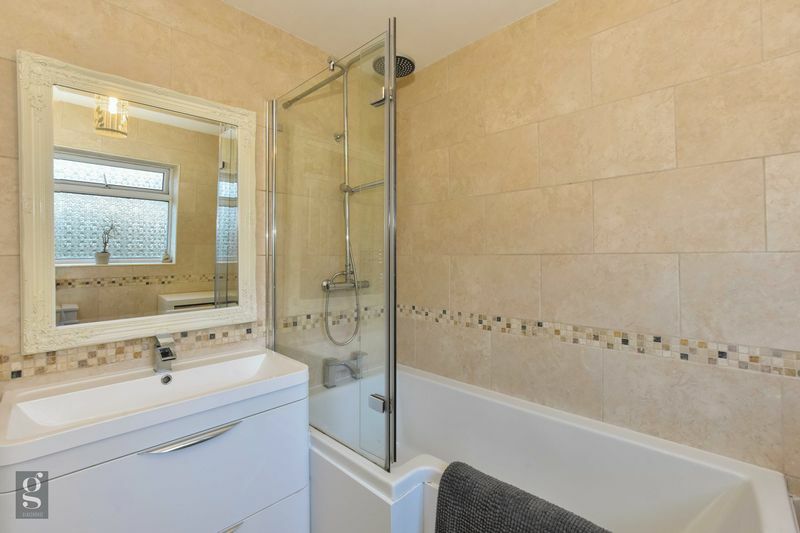 Family Bathroom – The fully tiled Bathroom features a ‘L’ shaped bath with glass to screen a wall-mounted shower with both regular and Rainhead showers. 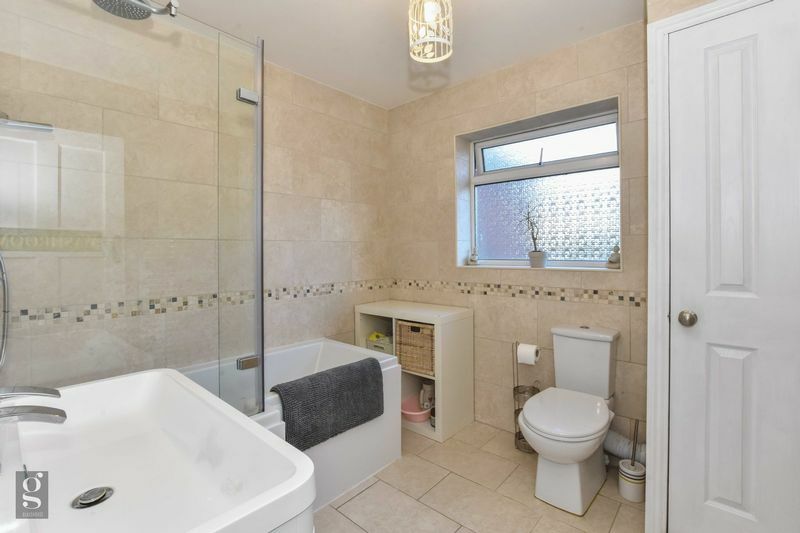 It is completed with an Ensuite-matching, rectangular basin unit, WC and chrome heated towel rail. To the corner lies the Airing Cupboard with fitted shelving and home to the 4 years old Worcester combi boiler. Attic – Accessed from the landing the Attic is fully boarded to provide great storage but also offers the potential to convert; subject to all relevant permissions. The front brick paviour Driveway provides parking for 2/3 cars. 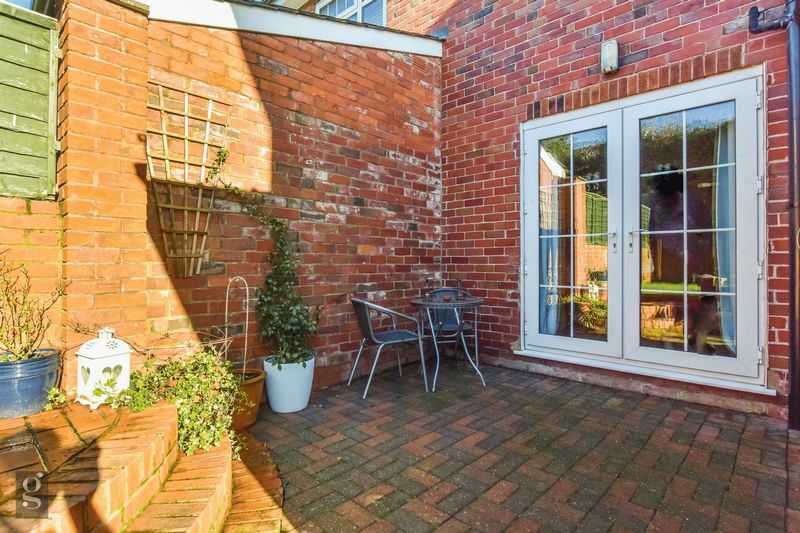 While the Attached Store with doors to either end, allows direct access into the enclosed rear garden. It usefully provides not only secure storage but with both light and power outlets, use as a small Workshop. 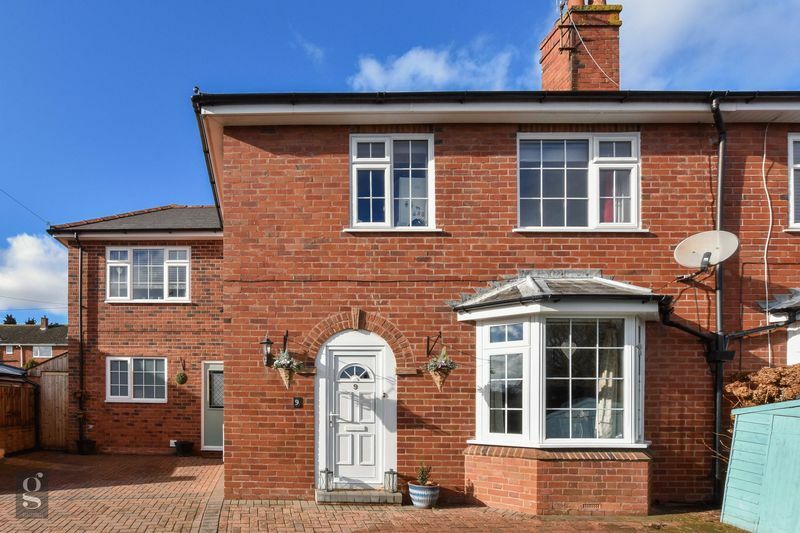 The double French doors of the Dining Room and the External door from the Kitchen both open onto a brick paviour patio before leading up the corner semi-circular steps onto the terraced lawn with beyond a gravel seating area and bark chip play zone. From Hereford take the A438 along Ledbury Road. Continue straight ahead at the roundabout and turn left at the traffic lights into Folly Lane. Take the first turning on the right into the discreet entrance for Folly Drive. 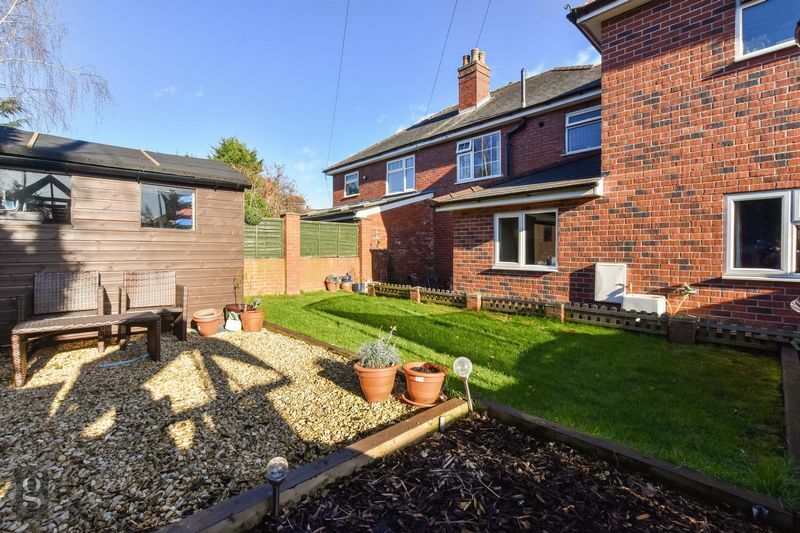 The property is to be found towards the far end of the cul-de-sac on the left.